Step Sequencer 2.0 - Digitaalityöasemien tehokkain askelsekvensseri. AudioSnap 2.0 - päivitetty audiokvantisointi- ja ajansiirto-teknologia. Uusi ulkomuoto, kaikkien ydintoimintojen parannuksia. Huomattavasti parempi työnkulku sekä parempi offline-renderöinti. Integroitu Arpeggiaattori - liipaise MIDI- tai instrumenttiraitojen arpeggioita. Laajat arp-parametrien säätömahdollisuudet. Satoja presettejä. Windows 7 -tuki testattu, valmis ja käyttöön suositeltu. Matrix View - Yksinkertainen ja joustava solupohjainen, ei-lineaarinen audio ja MIDI-editori. Reaaliaikainen triggausmahdollisuus. Session Drummer 3 - Cakewalkin virtuaali-instrumentin viimeisin versio. Helppo ja nopea rumpuraitojen luonti. Uusi käyttöliittymä, upeasti soivia settejä ja huippu-patterneja äänisuunnittelijoilta ja rumpaleilta. PX-64 Percussion Strip - Seitsemän tason prosessori erityisesti rummuille ja perkussioille. VX-64 Vocal Strip - Seitsemän tason prosessori lauluraitojen muotoiluun. Ohjelmaoptimointeja ja parannettu vakaus audion äänityksessä ja looppauksen aikana. Natiivi REX loop-tuki Track View, Media Browser ja Matrix View-ikkunoissa. “Hotswap” audio- ja MIDI-laitteita mukaanlukien ohjauspinnat. Ilman SONARIN uudelleenkäynistystä. Media Browser - Uusi keskitetty tapa sisällön hakemiseen SONARin sisällä; tukee monia formaatteja. Voit kuunnella ja tuoda rumpulooppeja, rytmejä ja MIDI-patterneja. Esiasetuksia suosikkihakemistoille. SONAR 8.5 Producer gives you what you need for recording, composing, editing, mixing, and mastering. Get innovations that matter, from exclusive features to ignite creativity and perfect your tracks, to groundbreaking technologies that always keep you in control, all backed by the industry’s leading 64-bit audio quality. 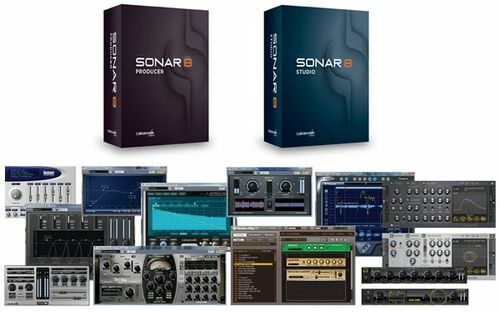 And SONAR 8.5 Producer delivers the go-to production tools you want with the best collection of virtual instruments, mixing, and mastering effects found in any DAW. SONAR 8.5 is the digital audio workstation that offers one-of-a-kind music creation tools to help you right from the start of the production process. Whether you are searching for new ideas or looking to add musical parts to existing songs, SONAR 8.5 can help you break through those creative blocks. Session Drummer 3 lets you quickly and easily create original, mix-ready drum parts for your productions. Get your groove on with hundreds of patterns ranging from vintage rock to electronica and 20 complete drum kits including genuine Roland® 707, 808, and 909 kits. Content providers include Ocean Way Studios, Steven Slate, Sonic Reality, and Groove Monkee. Matrix View lets you enter the world of non-linear music composition and experience a whole new approach to creating music in any genre. The Matrix view allows you to load audio or MIDI tracks, loops, and one-shots to improvise compositions on the fly. Instantly create remixes, sketch out different arrangements for any song, and even perform live with just your MIDI keyboard or pad controller. Step Sequencer 2.0 lets you create drum tracks, beats, bass, and synth lines with a click of the mouse. Save time with a convenient auto-populate feature for common rhythmic patterns. Don't settle for robotic, step-sequenced parts—the exclusive Per-step Probability feature lets you add automatic variations. Make your sequences even more exciting with nuances like flam, swing, and time-offset. Use the new per-track Arpeggiator to create new sections for your songs, breathe life into stale chord progressions, and discover new musical lines and hooks. With one key click you can experience sweeping staccato parts, chord strums, and lightning-fast runs to add new layers of sound to your productions. Rapture LE is a special version of the award- winning Rapture synthesizer. It includes over 200 programs & hundreds of oscillator shapes. Quickly load production-ready patches from growling leads to bumpin' basses and spacious pads - ideal for today's pop, dance, and electronic music. TruePianos Amber is a VSTi that provides realistic piano sounds, superb playability, and acoustic-style responsiveness. Get brilliant sounds with low CPU usage for optimal performance. Dimension Pro — your go-to instrument allows you to add both real and synthesized instrument sounds to your projects including synths, strings, basses, acoustic and electric guitars, vocal hits and more. Its immense 7 GB content library, featuring 2200+ programs plus the Digital Sound Factory Vol. 2 Classic Keys Pack, gives you endless possibilities. Media Browser lets you browse and preview audio and MIDI groove clips and patterns. Quickly build backing tracks for your song and preview MIDI with the virtual instrument of your choice. Guitar Rig 3 LE allows you to plug-in to the award-winning guitar amp modeler from Native Instruments. It includes 3 amps & cabinets, 11 effects, tuner, metronome, and over 50 presets. Track Templates make it easy to get your project started. SONAR includes a variety of templates for audio, virtual instrument tracks, and even entire projects. Save your own templates and recall them instantly any time you need that sound. Recording without limits—unlimited tracks of audio and MIDI mean you can create to your heart's content. Record your whole band, mic each individual component of a drum kit, even record an entire orchestra using a multi-channel audio interface. Loop Recording—record until you get the part perfect, try out different parts for your project, and play them back later—all hands free. Pure power—SONAR pioneered support for multicore and multiprocessor computers, Windows Vista, and x64 processing, and now version 8.5 is the first DAW for Windows 7. SONAR is optimized for high track count/low latency performance and a more responsive user experience, with version 8.5 we’ve further enhanced performance on x64 operating systems, and improved performance while recording and looping. AudioSnap 2.0: An innovative tool that makes audio timing issues a thing of the past. Perfect for musicians of any skill level, a super-friendly interface lets you easily correct drum and instrument timing, create remixes, and more. Set any audio to the tempo of your project, or change the tempo or timing of all the audio in your project – all while retaining phase coherency and superior audio quality. Roland V-Vocal 1.5: Perfect vocals – on pitch and in time. More than just pitch control, V-Vocal also gives you control over timing, dynamics, vibrato, and formant. With just a couple of clicks you can achieve natural sounding vocals with simple pitch correction, or crank up V-Vocal to achieve the robotic vocals heard on today’s popular Hip Hop and R n’ B hits. Smart MIDI Tools revolutionize MIDI editing by providing you with a powerful and customizable workflow innovation. Three tools can each be configured to perform multiple operations, saving you valuable time. Comping in SONAR is a breeze with powerful tools that take the headache out of getting the perfect take. Easily select the best performance from multiple takes and piece it together to sound like one flawless track. SONAR 8.5 gives you deep control over the look and feel of SONAR, virtual instruments, mixing, and includes innovative breakthroughs like Active Controller Technology. Synth Rack—SONAR includes a Synth Rack for easy access to all the virtual instruments in your project. Easily manage all the instruments in your project through one simple view. Active Controller Technology (ACT)—Get instant hands-on control of all your instruments and effects using ACT. Grab the knobs and sliders of your MIDI controller and know that they're going to control your favorite parameters on every instrument and effect you happen to be using in SONAR—just the way you want. Setup can be automatic or custom and either way it’s as simple as pushing a button and twisting controls. ACT takes care of the rest. With templates for most MIDI controllers and surfaces, ACT takes the guesswork out of mapping parameters by automatically doing it for you in the most logical and commonly used way. You can also customize ACT for your own workflow—just press the ACT button and twist knob or push a slider to assign parameters to your controller or surface. You can even set controls for each individual effect and instrument. SONAR automatically remembers which knobs and sliders control what functions and automatically remaps them for whatever you have on screen in front of you. You can also lock certain controls to always be accessed no matter what’s up on screen. Additionally, you can use ACT to take control of the console view and mix your projects. Best of all ACT works with the MIDI Controller or control surface you already own, whether it's an Edirol PCR series, a VS-700C, or any popular MIDI device. It’s that easy to get full control of SONAR using ACT. MIDI Controllers—easily add popular MIDI controllers including the Edirol PCR series for serious control of your virtual instruments. Even use ACT to mix your project via a MIDI controller. Control Surfaces—SONAR supports popular control surfaces including those from Edirol, Mackie, Euphonix, and Frontier Design. Enjoy the best control surface support in the industry. Control your Project—Keep your projects organized and your screen clean. Track folders are perfect for organizing groups of tracks such as drums or strings which can take up screen space. Know information about each trackt at a glance with Track Icons. Get around large projects fast with the Navigator View. Control SONAR—Make SONAR your own with complete global customization. Create your own keystrokes, Track Templates, UI appearance, color schemes, plug-in layouts, and more. PX-64 Percussion Strip is a 7 stage multi-effects processor that simplifies the art of dialing in your drum sounds by combining and optimizing the essential effects you need: EQ, compressor, expander, transient shaper, delay, and dual-stage saturator. Whether you’re dealing with a poorly mic’d kit, need to remove room noise, or just want to adjust the EQ, the PX-64 Percussion Strip instantly provides amazing sounding results. VX-64 Vocal Strip is a 7-stage multi-effects processor designed to make your vocals shine. The VX-64 Vocal Strip features EQ, compander, de-esser, doubler, delay, and dual-stage saturator—all in one plug-in. Make even ordinary vocals sound golden using the built-in presets or manually adjust settings to further refine your tone. Channel Tools provides easy and powerful zero-latency channel processing for adjusting L/R channel placement, gain, pan/width, and phase; sample delay for precision timing adjustment of L/R channels in recordings; Automatic Mid-Side decoding of imported Mid-Side recorded material. Channel Tools can also provide a widening or narrowing effect to stereo recordings through adjustments to mid-side gain. VC-64 Vintage Channel is a channel strip, dynamics processor, EQ, and De-Esser that's been called "the magic bullet for your tracks" by many engineers. It includes presets designed by professionals and can be side-chained. External hardware support allows you to use hardware gear right in SONAR. Tracks stay tight with automatic plug-in delay compensation for external and internal plug-ins. Perfect for outboard gear, stomp boxes, and more. Transient Shaper is a powerful tool for sculpting the transient dynamics of any percussive based source material. Great for drum loops and percussion, electric & acoustic guitars, and piano. Configurable Console—control volume, EQ, sends, pan, and much more just like a hardware mixer. You can also easily integrate most popular Control Surfaces or MIDI controllers. 64-bit audio mix engine means you are mixing with the best audio quality in the industry today. Best of all, you can take advantage of this audio engine on both 32-bit and 64-bit PCs giving you unmatched audio quality with spacious amounts of headroom and footroom through extended dynamic range. SONAR 8.5 also features native support for 64-bit floating point audio files, allowing you to import, stream, and render tracks and mixes at the highest quality available in the industry. Universal Bus Architecture—Take advantage of SONAR's infinitely flexible Universal Bus Architecture with unlimited sends, busses, and routing possibilities make organizing, grouping and mixing your projects simpler. Surround—SONAR 8.5 allows you to mix in over 30 different surround formats. When you're done, use the 14-day SurCode unlimited trial Dolby encoders for Dolby Digital and Dolby Pro Logic II. SONAR 8.5 also includes SurroundBridge giving you access to your stereo effects in a surround environment. LP-64 EQ is a linear-phase Equalizer that puts a professional sheen on your final mix. Get accurate processing and eliminate phase distortion that is common with parametric EQ. LP-64 Multiband is a linear phase mastering compressor/limiter. It provides clean, clear non-smeared control over isolated bands for volume maximization or attenuation/limiting with superior linear phase technology. Boost 11 is a peak limiter that gives your final mix maximum volume and punch. With Boost 11's simple interface, you'll have your songs radio- and duplication-ready in no time at all. TL-64 Tube Leveler is a line driver/ leveling processor with advanced analog vacuum-tube circuit modeling algorithm. Add the unique qualities of tube color and warmth found in classic recordings. 64-bit Mastering is a reality in SONAR with end-to-end 64-bit audio from native 64-bit audio files, tracks, busses, mastering effect inserts, to file export, your audio always retains its sonic integrity. Superior Final Rendering whether you're archiving a 64-bit floating point, 384 kHz final master, or exporting 16-bit/44.1 kHz audio for CD/MP3 through Windowed Sinc Sample Rate conversion and POW-r Dithering. Flexible Import/Export—SONAR has you covered: AIF, Broadcast WAV, FLAC, SD2 (Sound Designer II), QuickTime video, and many other audio & video file formats. Save time with flexible export options and faster than real-time rendering. Use presets in the Export options section to deliver files in virtually any format: stems, mixes, bounces, and more. Collaborate with studios and musicians using DAWs like Pro Tools, Logic, Cubase, and more—regardless if they are using a PC or Mac. Simply export your project as an OMF or Broadcast WAV files. Share your music—finish a project and immediately burn CDs or upload your music to the web. SONAR includes integrated CD ripping and burning, and Cakewalk Publisher to create streaming flash players to post on the Internet. 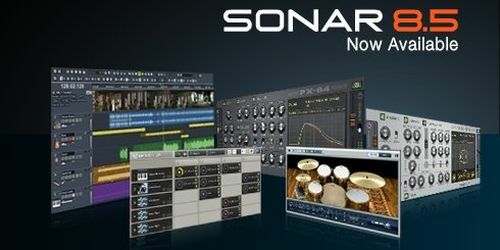 SONAR 8.5 Producer includes the best collection of included virtual instruments found in any DAW. Whether you're looking for acoustic or electric instrument sounds, emulations of classic gear, modern synthesized tones, drums, or a groovebox, you need to look no further than SONAR 8.5. You may be surprised to find that some of these included plug-ins would cost hundreds of dollars if purchased separately. SONAR 8.5 Producer provides an extensive array of audio effects. We pride ourselves on giving our customers serious processors and sound sculpting tools that you will really use, rather than padding the plug-in count with useless effects. In many cases you'll find more than one choice for a desired effect, giving you options when mixing or designing a sound. ***Required for audio playback. See www.cakewalk.com/PCResourcee for a complete list of recommended audio devices. *****Cakewalk Publisher requires you to have available web server space with FTP access privileges. An internet connection is require for music uploading. A broadband connection is recommended.